This Looks Like A Job for…SuperLative! The new season of our reading series began with a BANG! We celebrated the publication of the new anthology Who Can Save Us Now? 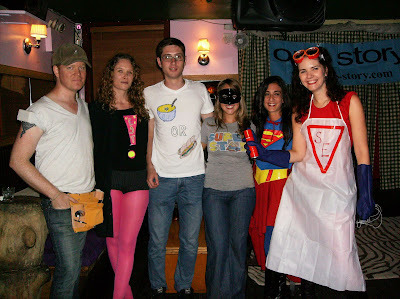 with a superhero-themed reading at Pianos on Friday, September 5th. The anthology, edited by Owen King and John McNally, features short stories about superheroes. Owen King (author of One Story Issue #85, “The Cure”), Kelley Braffet, and Stephanie Harrell (One Story Issue #60, “Girl Reporter”) read from their stories in the anthology. And the hard working One Story staff wore some colorful costumes. Hannah Tinti was Super Editor (who, as she pointed out, is a hero to some writers, a villain to others); Marie-Helene Bertino was the best Supergirl since Helen Slater retired the tights; webmaster Devin Emke dressed as a Super (because as New Yorkers know, a superintendent is often the only person who can save you); I was SuperLative (ready to triumph over mediocrity by making things that are just okay “the greatest!”); and Michael Pollock sported a homemade t-shirt that featured a drawing of a bowl of soup, the word “or,” and a submarine sandwich. “Soup or hero,” get it? You can listen to the reading here. Our next reading is next Friday the 12th when our own Hannah Tinti takes the mike to read from her acclaimed first novel, The Good Thief. This entry was posted in Author Updates, Events and tagged Hannah Tinti, Kelly Braffet, Owen King, Stephanie Harrell, Superheroes, Who Can Save Us Now? by Elliott Holt. Bookmark the permalink.